In our last comment on the 25th January here in the SPX R1 was coming up fast on the horizon, being then at 2680. That Friday this index’s intraday high was 2672.38, and it took quite a knocking before recovering to get back to 2680 the following Wednesday. Obviously, R1 had shifted, as even back then it was evidently on the slide, and today resides at 2715. So, we don’t know quite when it got above R1, but we suspect 2705 and 2715 would have played a considerable role at the end of last week. 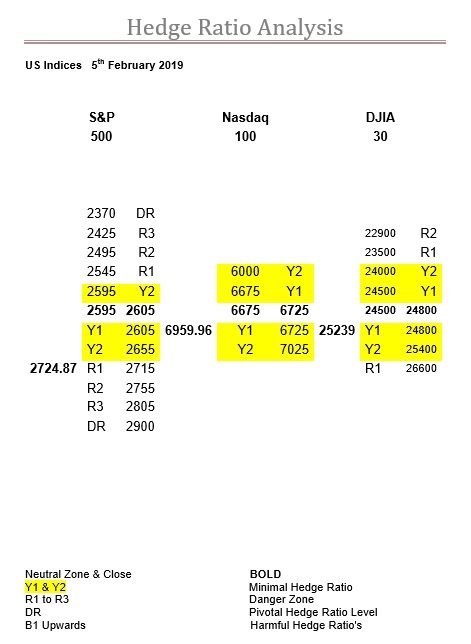 R2 is the next hurdle, which was at 2730 back on the 25th, so please bear in mind these ratios are receding. Also, we fully anticipate the zone moving up to 2645-2655, so, all in all three bullish indicators. However, this index is in a very precarious situation with 170-points of Y ratio below it, and it is the rollover next week, so time is now a factor. It is not unusual for this index to keep on knocking at the door of a receding R ratio, but please bear in mind the potential for a very nasty setback. The NDX is what is, and as it has been all expiry, one enormous ice-rink. There is virtually no ratio to speak of out there, so enjoy. Mind you, it still hasn’t stopped them adding strikes, like anyone cared, as judging by activity, with the benchmark so very low, to achieve only this is actually pathetic. Our only surprise, is that we are not seeing 2% or more daily moves. Although, out of interest, here it is now 0.95% away from their Y2. We have been at pains in the DJX to say how fluid the zone was here, and so far, this expiry we said it really could be anywhere between 23900 and 24600. Now, it is wider than normal, but at last it seems to have settled down to where it wants to be. Therefore, with the rollover next week, this could be significant. Don’t forget in our last comment we said Y2, which was then at 25100, could play a significant role, and we have no doubt at all that it did in the last few days of last week. The most obvious was the intraday high of 25109 on Wednesday, but it seemed thereafter this index was being very coy about going there again, resulting in a degree of divergence from the SPX. Today, it is at 25400. Interestingly, this is only 0.64% away for the DJX, but the SPX needs to move 1.11% to hit 2755.